Alert in her strange environment, feeling vulnerable perhaps, being unused to having a human with a camera so close. Highlight removed from the eye, to see which looks best. Still don’t know – on this small lo-res laptop screen. 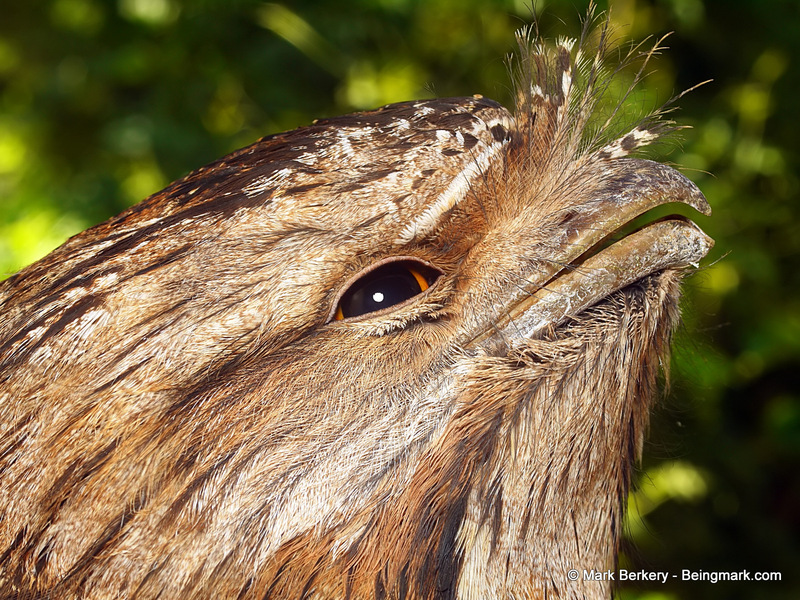 Carefully maneuvered for a shot with natural background, as she raised her head and opened her beak. That’s close enough, she said, don’t force me to fly in the daylight. Ok I said, and left with what I had – enough for now. Early morning, up the stairway of the old queenslander, and there she was. Sitting on the railing, looking a little out of place, keeping a sharp eye on the stranger, me. I gave her all the room there is at the top of the stairs and through the morning she watched me coming and going through slitted eyes. I have seen her at night on the fence, stalking the birds daytime feeding ground, where nocturnal creatures would feed on crumbs. Silent up close as on the wing, you never hear her come and go. But there she was. 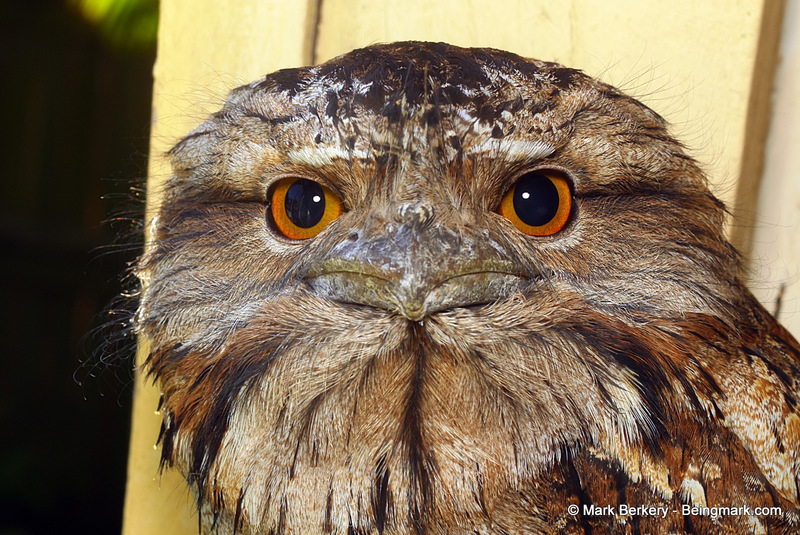 That is a Frogmouth, not an owl. Great photos! I greatly enjoy and admire your images. We aim to entertain … some. Beautiful :) What a wondrous visitor. 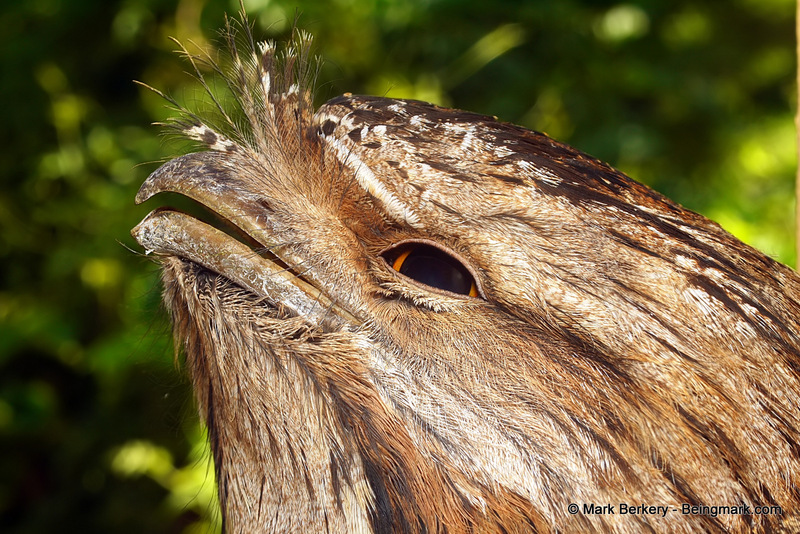 Thank you for sharing these beautiful photos, Mark, what a wonderful bird and a wonderful experience for you. Thanks Dee. A visit to the garden is a little adventure these days, after years of wild care and development. What great photographs. 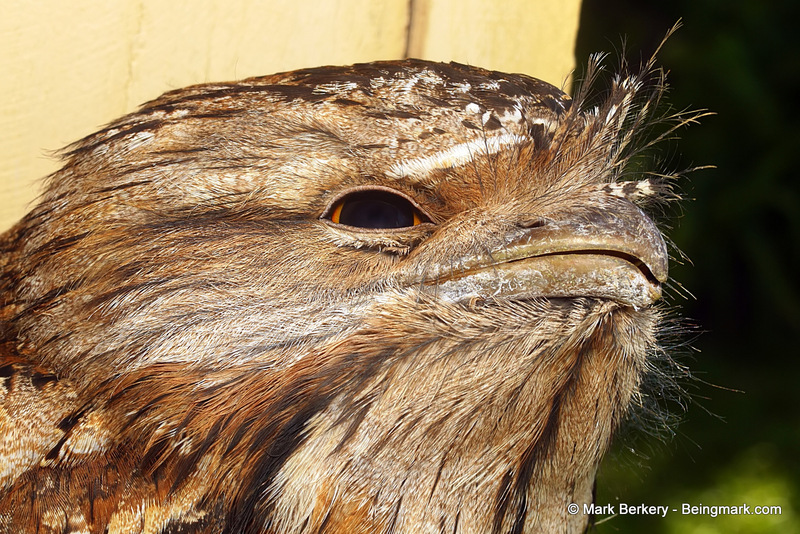 We are lucky enough to have frogmouths visit here in Sydney, one of my favourite birds. Thanks Leonie. A wild and wet garden will attract many creatures. It’s a bonus when the bigger ones make the verandahs their home too, if only for a day.